This series of steps will walk you through the three phases of implementation. Repeating the process will help you reach your desired goal for 21st century skills development. The majority of emphasis is placed in the planning and preparation phase to increase your skill building foundation. Yet MHA Labs understands that what actually happens may be different. Your plan is a living, evolving strategy. Call it trial and error or continuous improvement, whatever language you use, just keep at it! » Review MHA building blocks. Begin to familiarize yourself with the 35 core skills. They will immediately connect to skills you work on every day. » If you already have a lesson or program design, take time to identify skill expectations that are already present in your activity or job tasks. Examine your curriculum, program plans or job descriptions. Wherever you see the an aligned skill, write it on a Post-It® and tag the activity. » Identify performance evidence by naming the results you expect to see at the end of your lesson, activity or work assignment. Add evidence reminders to the post-it. » Identify potential feedback prompts that will promote real-time reflection on skills growth. Write the prompts onto your post-it. » Identify instructional strategies that can deepen the skill building experience. Write this strategy as the final addition to your skill-up post-it. » Examine the results of your planning process and see where you are already strong. Identify skills that were not addressed. Brainstorm where you can adjust and enhance activities to include more opportunities for skill-building. Add a post-it to mark the update. » Next time you edit your documents, add the post-it content and you will have a 21st century skills aligned portfolio. » Fully engage youth in the skills development process. Dedicate time at the beginning of a school year, program cycle or job to engage youth in understanding the 35 skills. Sample activity: Skills Improv works anywhere. Place a set of scenarios into a hat that relates to your class, program or job. Teams pick a scenario and act it out. The audience then identifies as many of the 35 skills being demonstrated. This builds a supportive peer environment as well as knowledge of the Building Blocks. » Make skills transparent by publicly posting the skill objectives needed for the week’s related tasks. Feel free to incorporate related terms that translate the building blocks into your own language and culture – for example ”persistence” as a personal mindset. » Conduct the activity as planned. You may be repeating an activity for the 100th time, but now you are observing for 21st century skills in action. To assist, use accessible tools like Post-its® to record in-the-moment examples of evidence or customize more advanced tracking apps. » Engage in reflection and continuous improvement. Take time to reflect on the experiences and evidence you have collected. This information can provide thoughtful analysis of a youth’s overall performance. When viewed in aggregate across youth, this information provides a holistic analysis of your 21st century skill building practice. » Use MHA Labs series of appraisal tools to create a data supported reflection and improvement practice. Human Achievement Quotient (HAQ): A formative, observed assessment used to gauge 21st century skills development in a school, program or work context. The data is protected for formative use only. A summative “point-in-time” observed assessment used to evaluate youth for workforce and college preparedness. This is used to translate youth performance into a college and/or employer recommendation. A summative “point-in-time” employee performance review used to evaluate employee performance for development, promotion, and retention. MHA Labs Quick Start To 21st Century Skill Building! it will be to engage in MHA Labs recommended 3 step skills development practice. Think of a class, program or job where you want to promote 21st century skills– this is your context. Think of a student, participant or employee that exemplifies success. Recall a few stories where you were really happy with their performance– this will be your strengths evidence. Use any of the MHA Labs Building Block tools to identify every skill that you think contributed to the success of this person. If you repeat steps 2-5 with additional youth, you will begin to see consistency in the skills that drive success in your context. You can then document these skills as your class, program or job objectives – these become your skill expectations. Next, write a brief feedback script on the youth you chose. Unlike “Good Job” praise, skill-building feedback conversations include 5 components—context, expectation, evidence, feedback, and suggestion. MHA Labs provides Feedback Planning worksheets for your convenience. Within the next 24 hours give this person your feedback. Be sure to engage them in a conversation by using feedback question prompts rather than dictating your comments. This deepens understanding and reveals new insights. When done, ask how the experience went to gauge your new feedback method. Afterward, celebrate. You just did the core practice of 21st century skills development. Typically youth success is communicated as “good job” praise or a letter grade. Successful youth need to know their exact skill strengths and how they can be applied to intensify performance. Most people are conditioned to focus only on what is not working. This can have a negative effect on personal well-being and motivation. Starting with strengths creates a positive culture for both you and youth. A strengths-based inventory can be effectively used to address growth areas or performance issues. Over time, youth learn to automatically use their own strengths to solve problems. Too many youth who perform poorly in academics believe they are failures. You can now legitimately acknowledge their 21st century skills strengths to increase self esteem and create a positive skill-building relationship. 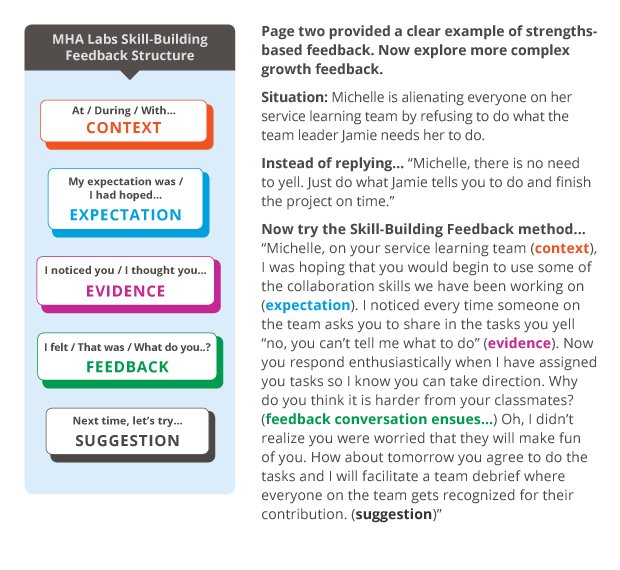 MHA Labs 21st Century Skill-Building Feedback Method! Providing timely feedback is vital to skills development – Yet too few people do it. Why? Fear to give it and fear to receive it. People are extremely reluctant to give feedback for fear of being negative. People are extremely defensive receiving feedback for fear of failure. MHA Labs makes a critical distinction between performance judgment and judgmental feedback. A person may meet/exceed an expectation (positive) or not (negative), but the feedback you give in both circumstances should be non-judgmental and developmental. In response, MHA Labs developed a simple method to promote skill-building feedback and minimize the tendency to use judgmental language. Skill-building feedback incorporates 5 core components­—context, expectation, evidence, feedback and suggestion. Incorporating this method into your own personal communication style can transform your skill-building practice.